There are two elements to that question – one, my nickname is Coach McFi because at an old workplace there was another Fiona and she was already there when I arrived, so having a surname that started with Mc, I became McFi and when I am coaching, some people have extended that to be CoachMcFi. The second element is why do I coach? For that readers, strap yourself in because I’m not sure I’ll be able to give all the reasons! Let me give you some examples of why not to coach – which is what is often used as a topic opener for people talking to me about this. Marion Jones, Mike Tyson, Diego Maradona, Tiger Woods, Lance Armstrong and others have all individually brought sport into disrepute. The AFL and NRL teams with their salary cap breaches, the current issues with the Australian Swim team’s performance in London after poor athlete behaviour disrupting the camp, the four doubles badminton teams that were thrown out of the London Olympics for match fixing – something that was described as cheating on the holiest of sports events. The ongoing investigation into drugs in sport in Australia which has tarred us all with a dark brush is something I have to admit makes me very cautious as to my next steps in a field of work that I love so much – I should graduate next year from a degree in coaching and exercise science but do I really want to make the jump out of my current career into one that is much less stable and will at best halve my pay? If people are going to be so underhanded, if the pay is so crap unless you’re at the top, if the hours are so long and for many it’s done on top of working at their primary income source, if you face abuse (despite not being tolerated in sport) from parents/partners/athletes/spectators, why be involved at all? Let me share some stories that are my why’s…. Last week a colleague of mine at work posted a basketball video on facebook that made me cry. Happy tears, not sad ones because the video was so touching (if you have a couple of minutes just now, please watch it before reading on). Moments like the one in the video where all barriers life presents us with are completely torn down often give me the strength to get through the tough times that arise. 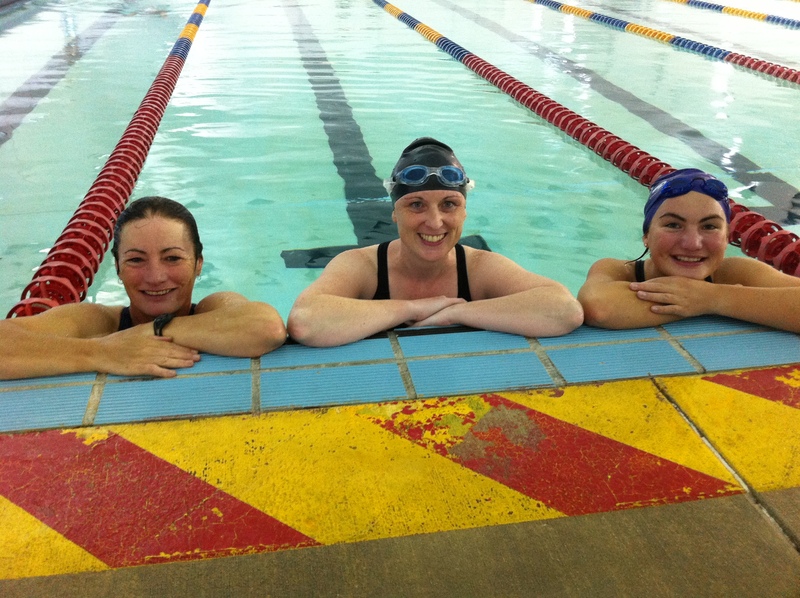 Three ladies I recently worked with on their swim technique – I got back as much from them as I hope they did from me and I’m really looking forward to now taking their squad long term again. Two weeks ago, I was filling in for another coach with triathletes doing swim training (my strength as a coach). In one of the lanes was the three ladies pictured below – mother & daughter on the outside who had just started with our club and one of our graduates from this season’s novice program. They can all swim, they all race and they can all get through a 90min training session with us. All of them though have the hunger for self improvement (and let’s face it, if you can spend less time swimming in the lake in Canberra, all the better!). Without wanting this to sound like an advert, I know I can help them. I don’t know how I know the best way to communicate to them refinements in their technique, it just happens but as you can see from their cheesy grins (lucky you can’t see mine behind my iPhone) they were willing to also help me by posing for this post. …I will post later about future goals for me – this is just a start I hope – but at this time sincere and heartfelt thanks to all the coaches who have taken us this far – Garry especially! The others are too numerous to name, you are all great – but a personal thank you to Fiona for teaching me to swim – i owe you a beer when you return from sunny Europe Cheers to you all, Phil. It still swells my heart and gets me all full of pride. Phil lost an extreme amount of weight over the program and the following years, went on to longer distance triathlons (pretty sure he even did a half ironman) until his progression in his professional life took off with the new found zest he had for his whole life. When Phil gave up smoking and started this journey, I doubt he had any idea of where it would take him and the impact he’d have on other people. Another story is of a female triathlete (I won’t mention her name because I am conscious she doesn’t like limelight despite how incredible she is), who came into our program barely able to walk because of her size. She told me she took on the challenge of the program to shut her mother up – her mother was badgering her to make friends. This lady was in her 40’s, single, introverted but happy – or, as she told me later, so she thought. The program was based around helping people from all walks of life to complete a triathlon. In that year, we had people who were ex-pro athletes from other sports and the age range was from late teens through to early 60’s. Possibly the most diverse group we’d had but that is one of the many reasons I love coaching it. By the end of the program, this lady had not only completed her first of then to be many triathlons, she’d made friends outside her work. She was getting out more and her mother was relieved to find she was having to call her on the mobile rather than house phone to get in touch. I am so not claiming it was all me, but I’m happy to know I helped facilitate a change that led to this lady leading what she described as a self imposed oppressed life into one where she felt like she now could try out many more things. She now races at events up and down the coast – she always thought she was too fat to go to the beach but when she’s racing she’s part of something and feels she has a place there and has even now tried snorkelling, surfing and sailing. This is just a few examples of how becoming physically active has positively altered the lives of others. Not everyone is nice but I figure they’re just different to me and they will find a coach somewhere that is perfect for them. Just like the volunteer work I’ve done with Cure Cancer Australia, the Red Cross, the Salvation Army or serving in the Royal Australian Navy and soon I will serve the community in the Rural Fire Service, coaching for me is about serving others to help them in their life journey and in return I gain self satisfaction and learn so much from them….this last part, is a whole other post! This is the first part of the story of a time in my life I wouldn’t wish on my worst enemy but one that has made me who I am today. I am by no means anyone of significance and there are many who have been through challenges I don’t know that I could cope with, but there have also been many that have crossed my path that have found strength from my story. I share it not to big note myself or point fingers but because last night my housemate and I had a frank discussion about life post-cancer and for the first time in years, I didn’t feel alone and that made me realise I might help someone else feel the same if I relive some of my darkest days. Thank you Iain. 1997 was perhaps the worst year of my life – although there have been many significant events throughout the years, that year just plain sucked. It was to be the start of my promising career in the Royal Australian Navy – a journey that my Mum and I had worked together on my gaining entry, one where I’d already received a scholarship for my year 12 (final high school year) studies and one where I had a grand long term career plan of becoming the first female admiral. Although it wasn’t to be, I like to think that without having been through that year, I wouldn’t be the awesome person I am today (don’t get me wrong, I’m human, I still have flaws but I am also still awesome). I saw in the New Year with my family in my uncle’s house in Brackley – a town in Northamptonshire (which always makes me think of Jane Austen) in central England. My Uncle had dubbed me the Fire Monster because I was always on the floor in front of their faux fireplace (looked like a wood/coal fire but was actually gas). It was a good night even though the family trip home was so sombre. My Mum had been diagnosed terminally ill with cancer. So she made her final trip home to the UK to say goodbye to her family. While we were away, I got a call to say I had finally cleared medical and was set to join the Navy at the Australian Defence Force Academy (ADFA) on the 20th of January – 10 days after we returned from the UK. I was psyched up and relieved that my Mum would rest easier knowing my future was secure. Two days before I left, we went to Sydney to stay with my Godparents (my departure point to go to ADFA was the Sydney recruiting centre). 24hrs out is when all the fun started. We’d been out for dinner on our first night in Sydney to the Souths Juniors Rugby Club. I remember ordering a medium rare steak. Even though I was 19, I’d rarely eaten steak and I think this was my first real one and I’d ordered it because my Godfather had ordered one and I wanted to show I was strong like him – strange why we do some things! The following morning I started vomiting everything I tried eating. What little food was left in my system was quickly expelled from my bowels and I was wiped out. We all thought it was nerves/excitement and I remember my Mum and Godmother quickly thinking up ideas to get me out of the apartment and enjoying my ‘last deh of FREEEEEDOM’ as my Godmother who had recently watched the movie Braveheart, best put it in her thick Scottish accent. I just wanted to make Mum proud and even though I knew in my heart that she was, my mind was screaming at me – you’re sick but don’t let her know. Mum had been diagnosed the previous September. By this stage she had clearly shed weight although we never talked about it beyond her joking about all the money she’d wasted over the years on weight loss programs and all she needed to do was get cancer. Even when she was dying she was trying to make life easier for everyone else to cope with. The following day we went to the recruitment centre to undertake our entry medicals. When I went to weigh in, I hadn’t even thought about having been sick. My weight was a problem though – based on the BMI measures, the lower scale of the healthy weight range for my height (170cm/5”6’) was 58kg (around 128 pounds). The most you could be underweight to join the military was by 4kg (around 9 pounds) but I’d always weighed in at 52kg (115 pounds) right through the scholarship selection process and the entry process. I’d worked hard with a dietician to get my weight up and I had reached 56kg before I went on holidays where I did next to no training while we travelled around the UK. When I stood on the scale, it came up at 52kg….the staff pretended they didn’t see me arrive and asked if I was thirsty suggesting I could have the whole jug of water if I wanted because I’d need to give a urine sample later anyway. I drank the water and weighed in at 54kg. I was off to the academy! Waving goodbye to my parents, godparents and one of my closest friends Steven (who not only had made the 3hr journey down to see me off but had also been there at the hospital with me while I waited for my family to arrive after Mum had been diagnosed – I was the one who had to break the news to everyone) was one of the most difficult things to stomach. I knew I would see them again but I was losing time with all of them – especially Mum and although we didn’t know it at the time, Steven too. Our bus stopped on the freeway to Canberra for a light meal – cut sandwiches. I ate one triangle and it took about 20mins after we were back on the bus for it to affect me. I needed to vomit badly. I started to cry not understanding why when I had worked so hard, could my body fail me by being so nervous that I couldn’t hold down food? Some girls that I had met through the recruitment process suggested trying to sleep or listening to some music both which helped keep me calm but I still felt sick. We arrived at ADFA, met our section commanders, collected our bags and commenced moving through a large auditorium to collect our kitting. It was summer in Canberra and at 7pm at night it was still over 30 degrees and very dry – having come from the coast where it’s humid, it felt really hot. Sweat was pouring out of me and I just wanted to sleep. Once we had everything, our section commander escorted me up to our blocks. I had to ask my section commander 3 times to stop – I was so weak I couldn’t keep up and although I was terrified that I’d be yelled at and I could see he wasn’t impressed, he let me catch my breath, took some of my kitting for me and keep going. The walk would only take 3-4minutes normally when you aren’t pulling luggage etc, but that night I think it took us 15 to 20. When we got up to the block, we left my luggage outside and I was taken up to the rec room to meet the divisional captain – now, still a friend of mine, but then he was one of the hierarchy. By the time I got to my room and had time to myself, it was around 10pm and it was only just below 30 degrees outside. The following morning reveille was at 6:30am and after hearing in gruff tones what we needed to do, we ran back to our rooms. Craig, my classmate, had arrived after I’d gone to bed. He bolted to the shower, I bolted to the toilet and threw up again – I’d been awake since 5am needing to be sick but was too afraid to leave my room without permission. I ran back to my room, made my bed in the military way, swapped spots with Craig in the bathroom while he ran to his room and then we ran to the landing again ready for our next instruction. The next few hours were a blur – I threw up again at breakfast and by now had confessed to Craig that I thought I was sick. He had been an air force cadet (although he joined the army) and when we filed into the hall for an address by the Commandant and other senior officers he stuck close by my side and introduced me to several people he’d met through cadets over the years. In the middle of the brief a wave of nausea came over me again but there was nothing we could do – we were in the middle of a row in the middle of the hall. As soon as we were able to get out, I ran to the bathroom again. We were due to go to morning tea but while I was in the bathroom, Craig had approached one of our third years (senior trainees at the academy) and told him how sick I’d been. They took me to the doctor and I was admitted to the Duntroon Hospital – I hadn’t even been at ADFA 24hrs and aside from having my wisdom teeth out in day surgery, I’d never been admitted to hospital in my life. I was grateful to get some more sleep but fretting over what I was missing. This was the start of my life at Duntroon hospital. I say life because over the next two and a half months, I was there no less than 3 days of every week and for someone who never sat still, it was more demoralising than any of the games they played to turn you into a fine military officer. They couldn’t find anything wrong but I’d dropped down to 42kg (92 pounds) in the first 2 weeks. Between that first day and Easter, I became such a difficult case that the only conclusion was that I was faking it. I had one doctor on my side and between him and the surgeon that operated, they saved my life. Part 2 to follow soon – I will add some photos once I can lug my photo albums to a scanner.